Owen Hayward has climbed another good new problem at Trwyn Talfarach. It Came from Beneath 7A+ gives some great 3D climbing, and as you can see from film below, a pretty wacky 360 manoeuvre. Start sitting on the flat rock under the boulder left of the finish of Phobia of Fishy Smells. Pull on with specified start holds: left: left edge of steepness, right: choice of small sidepulls/edges in roof, toe hooked under bottom lip of block. Latch the slopey lip above with your right then work out left to finish up the yellow face (using the juggy chockstone for hands). The wall behind and all other chockstones are out of bounds. 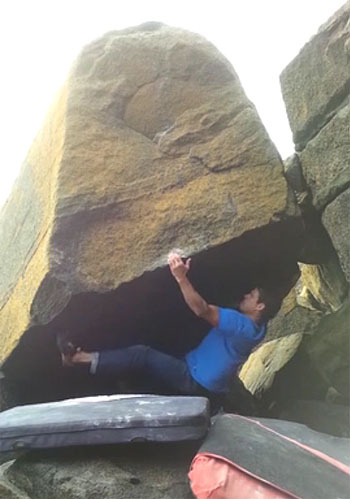 Ysgo Far Side and Talfarach bouldering from Owen Hayward on Vimeo.